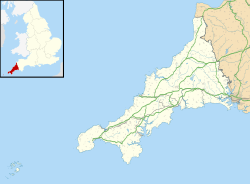 Royal Naval Air Station Culdrose (RNAS Culdrose, also known as HMS Seahawk; ICAO: EGDR) is a Royal Navy airbase near Helston on the Lizard Peninsula of Cornwall UK, and is the largest helicopter base in Europe. Its main role is serving the Fleet Air Arm's front line Merlin helicopter squadrons. Admiralty surveyors first started preliminary surveys of land near Helston in 1942. RNAS Culdrose was built by John Laing & Son and commissioned as HMS Seahawk five years after these initial surveys. The station was originally designed to be a wartime airfield lasting about ten years. The initial plans were for Culdrose to serve as a Naval Fighting School, it soon developed other roles. These varied roles included such things as the trials of the Navy's first jets, training of airborne early warning crews and as a home base for carrier-based aircraft. Over the years the station's emphasis changed from fixed wing aircraft to rotary wing, although its main role remains largely the same. In 1958, HMS Seahawk was given the Freedom of the Borough of Helston, an parade thanking the town was set up in 1958 and is still happening, on the 20th September 2018, the parade celebrated its 60th anniversary. From 1968 it was one of the designated locations for plan PYTHON, the plan for continuity of government in the event of nuclear war. On 18 May 2012, British Airways flight BAW2012 carrying the Olympic Flame, from Athens International Airport, landed at RNAS Culdrose. The aircraft, an Airbus A319 painted yellow and named 'The Firefly', carried dignitaries including Seb Coe, Princess Anne, and David Beckham. The following day the Olympic Flame started its first leg from Land's End, through Cornwall, to Plymouth. Its final destination was the Olympic Stadium in time for the start of the 2012 Summer Olympics. The airbase puts £100 million into the Cornish economy and is one of the largest single-site employers in Cornwall. Flying and notable non-flying units based at RNAS Culdrose. 814 Naval Air Squadron and 820 Naval Air Squadron operate the AgustaWestland Merlin HM2 primarily in the carrier based anti-submarine warfare role. The Merlin is fitted with an advanced sensor suite of active/passive sonics, Orange Reaper Electronic Support Measures and Blue Kestrel radar and provides a strong force in under-water warfare and anti-surface unit warfare. The unit's various roles include protecting the Royal Navy against surface and sub-surface threats, command and control, transport, evacuation and Search and Rescue capabilities. 824 Naval Air Squadron is the Merlin Operational Conversion Unit, incorporating the Operational Evaluation Unit flight. The Merlin Training Facility (MTF) is part of 824 NAS, and is a first in that it encompasses pilot, observer, aircrewman and engineering training under one roof. The facility comprises a Cockpit Dynamic Simulator (CDS), 3 Rear Crew Trainers (RCT), 6 Part Task Trainers (PTT), computer-based training (CBT) classrooms, a Mechanical Systems Trainer (MST) and a Weapon Systems Trainer (WST). Hangar W3, home to the Merlin Depth Maintenance Flight. The Merlin Depth Maintenance Facility (MDMF) performs depth maintenance on AW101 Merlin helicopters of the Royal Navy. MDMF is located at RNAS Culdrose, and is a partnership between the UK Ministry of Defence, AgustaWestland, Serco and Lockheed Martin. For UK Merlin helicopters depth maintenance is centred on a 3-year cycle. MDMF is based upon a pulse line system, similar to a production line; each Merlin "pulses" through 9 phases in turn - removal of major components, inspection, structural repair, fault rectification (3 phases), rebuild, systems test and flight test. The Royal Navy's airborne surveillance and control capability is provided by the Sea King ASaC7's of 849 Naval Air Squadron., though under the recent retirement of Royal Navy Sea Kings, this is due to be replaced by Merlin crowsnest. All rotary wing (helicopter) pilots, observers and aircrewmen are assessed annually by NFSF(RW) examiners. This covers all helicopter squadrons at RNAS Yeovilton as well as Culdrose. The assessment consists of a ground exam and a check flight, and may also occur if a squadron has referred them to NFSF(RW). The Engineering Training Section (ETS) at RNAS Culdrose is a unit of the Air Engineering Department that is dedicated to the instruction of Merlin Mk2, Mk3 and generic air engineering training. The primary task of the ETS is to train sufficient air engineering personnel to enable the front line to achieve operational capability. It comprises approximately 20 personnel including both service and civilian instructors and is headed by a lieutenant who is responsible to Commander of Air Engineering. Hawk T1's of 736 Naval Air Squadron provide a maritime aggressor squadron for Royal Navy ships and vessels of other foreign navies, simulating missile attacks and fast jet attacks on warships in the naval exercise areas south and west of Plymouth. The unit is an evolution of the previous Fleet Requirements Aircraft Direction Unit (FRADU) and is supported by the defence contractor SERCO. 750 Naval Air Squadron provides training for the Fleet Air Arm's observers and operates the Beechcraft Avenger T1. 700X Naval Air Squadron is the Royal Navy's first squadron of unmanned aerial vehicles (UAV) using ScanEagle aircraft. In 2014, 700X Naval Air Squadron was one of the smallest naval units with twelve personnel but numbers could double the following year. 1700 Naval Air Squadron provides qualified specialist officers and ratings to man, operate and maintain all Royal Naval controlled systems in all aviation capable platforms in both the Royal Navy and the Royal Fleet Auxiliary. The unit provides tailored teams, ranging in size and specialisms and can comprise aircraft handlers, aircraft controllers, fire-fighters, military police officers, logistical personnel, engineers, medics and other specialists to allow the continued operation and protection of naval aircraft worldwide. Established in December 2007, the unit was previously known as the Maritime Aviation Support Force (MASF). It was renamed 1700 Naval Air Squadron on 31 October 2017. The Royal Naval School of Flight Deck Operations provides professional training for all naval aircraft handlers. The school also trains other Navy personnel and personnel from the RAF and Army who will be involved in operating aircraft at sea. Trainees are trained in activities they will be required to carry out during their career, such as tackling aircraft fires and aircraft deck handling. Equipment used includes; mock-up can be produced and adjusted at the instructors control and the "Dummy Deck", a full-sized replica of an Invincible class aircraft carrier's deck allowing trainees to practice their roles in realistic environments, experiencing training with live aircraft with reduced risk and danger compared to operating on a real aircraft carrier. RNAS Culdrose has a satellite airfield at Predannack which it uses primarily as a relief landing ground for helicopter pilot training; it also houses a small arms range and aircraft fire fighting facilities. The Band is the smallest Volunteer band of the nine bands and performs regually at in Base and out of Base events. On 7 June 2016 the band performed a dawn fanfare on the King Harry Ferry to honour the official birthday of HM Queen Elizabeth II. They also perform at RNAS Culdrose's annual Air Day. The squadron was disbanded on 31 March 2008. With two Merlin helicopters, Squadron 700M carried out trial modifications and developed tactics and operational procedure. The Motto was : "Experienta Docet" – "Experience Teaches"
FRADU was operated by the contractor Serco Defence and Aerospace as part of the RN MAC 2004, using 13 BAE Hawk T1 advanced jet trainer aircraft on lease to the Royal Navy from the RAF and based at RNAS Culdrose. Two of these aircraft were permanently detached to Naval Flying Standards Flight (Fixed Wing) at RNAS Yeovilton where they were flown by RN pilots, but maintained by Serco engineers. With the draw-down of the Sea King force and the return of British forces from Afghanistan, 854 NAS & 857 NAS were merged back into 849 NAS in 2014. 771 was responsible for search and rescue in Cornwall, the Isles of Scilly and the western English Channel, in total an area of approximately 200 nmi (370 km; 230 mi). It also administered the Sea Kings on detachment at HMS Gannet. The squadron was stood down on 1 January 2016, decommissioned on 22 March 2016 and was responsible for saving over 15,000 lives on more than 9,000 missions. Between October 2004 and March 2018, 829 Naval Air Squadron provided up to three ship's flights capable of deploying with Type 23 frigates. The squadron decommissioned on 28 March 2018, with the unit's aircraft and personnel becoming part of 814 Naval Air Squadron, creating the largest ever Merlin squadron. ^ Airport information for EGDR at World Aero Data. Data current as of October 2006. ^ a b c "RNAS Culdrose". Royal Navy. Retrieved 19 September 2014. ^ "If nuclear war had broken out between Russia and the west, HMS Osprey on Portland would have been a remote hideaway for the government". Dorset Echo. 28 January 2017. ^ "Olympic torch: Flame arrives in UK for 2012 torch relay". BBC News. 18 May 2012. Retrieved 18 May 2012. ^ "BBC - Olympic Torch Relay - Land's End to Plymouth". bbc.co.uk. Retrieved 12 September 2015. ^ "RNAS Culdrose". Royal Navy. Retrieved 6 November 2017. ^ a b "814 Naval Air Squadron". Royal Navy. Retrieved 6 November 2017. ^ Editor (4 October 2006). "Integrated Merlin Operational Support Goes Live". defencetalk.com. Retrieved 12 September 2015. ^ "Markets". Serco. Archived from the original on 8 April 2010. ^ "849 Naval Air Squadron". Royal Navy. Retrieved 6 November 2017. ^ "750 Naval Air Squadron". Royal Navy. Retrieved 5 May 2015. ^ "Royal Navy launches first 'drone' unit". BBC News Cornwall. BBC. Retrieved 29 November 2014. ^ "Maritime Aviation Support Unit becomes 1700 Squadron". Royal Navy. 2 November 2017. Retrieved 6 November 2017. ^ "829 Naval Air Squadron". Royal Navy. Archived from the original on 14 November 2014. Retrieved 6 November 2017. ^ "829 Naval Air Squadron". Royal Navy. 29 March 2018. Retrieved 29 March 2018. London, Peter, (1999), RNAS Culdrose, Sutton's photographic history of aviation series, Sutton Publishing Ltd, 128pp, Gloucester UK, ISBN 0-7509-2230-3. Wikimedia Commons has media related to RNAS Culdrose.